DOWNLOAD Over 320 Snare Samples w/ Free Upload! Supreme Snarez Collection (Volumes 1 & 2) - Featuring over 620 one-shot samples of hot contemporary hip-hop, trap & r&b snare samples (354MB total), ModernBeats delivers BIG with the "Supreme Snarez" Collection (Volumes 1 & 2). Packed with a wide variety of original snare designs perfect for today's Pop, Trap, Hip Hop, R&B, and Dance tracks, this amazing two volume drum collection is ModernBeats' most prized snare sample library ever! All samples were recorded at 24bit, 44.1khz for high sonic fidelity with snare styles including ModernBeats original designs, plus styles modeled after pop and hip-hop's biggest producers such as Timbaland, T. Pain, Stargate, Scott Storch, RedOne, Dre, Trak Starz, and more! SPECIAL SOUND DESIGN NOTE: Several of the snare samples in this set were designed with sweeping dynamics at the start of the sample and DO NOT begin with a direct snare attack. This is intentional and allows for more desired snare expression and dynamics when producing modern drum beats. For example, by triggering and aligning these sweeping samples earlier in your sequencer and centering the audible attack of those samples over the main pulse of your song's tempo, the pre-snare nuances will sync up properly, bringing more realism into your production. A different effect can be achieved with centering the attack later, making the snare/clap seem sluggish and loose. The "Supreme Snarez" Collection represents the hottest snare library you'll find for Pop, Trap, Hip-Hop, and R&B! 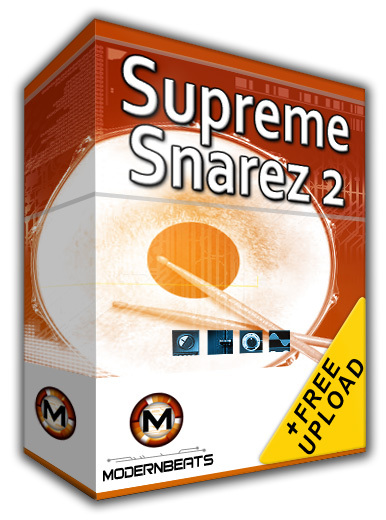 Excel your beats to maximum potential with "Supreme Snarez" from ModernBeats!